I literally had a bet with Garance that I could find a good way for a guy to wear leopard. I think this photo proves I won! And you have to say, the leopard print is very quiet, not as loud as most of the prints out there. Love the print of the cluth kind of bag. besides the leopard, both the gentlemen are dressed superb yet natural. great shot! besides the leopard, i like that both the gentlemen are dressed immaculate yet natural. great shot! 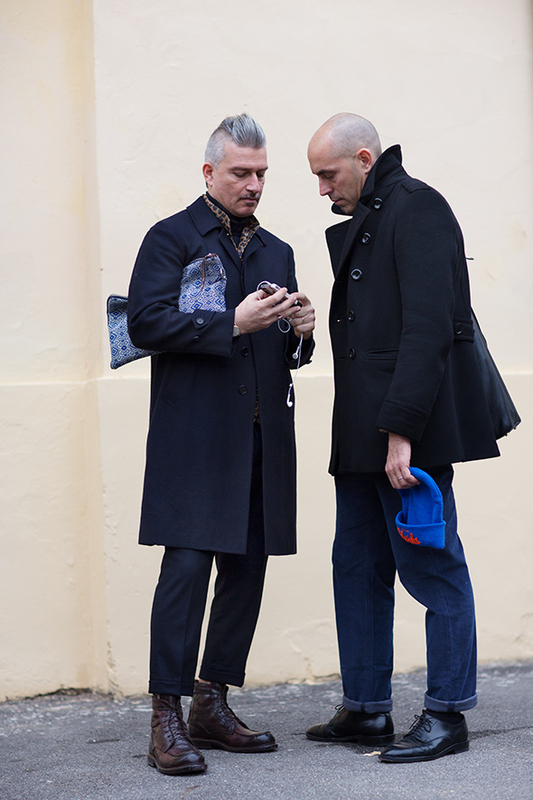 Okay I’m reworking my whole wardrobe just in case I may be photographed by the sartorialist. Well not really, but I made it my inspiration for the way I dress this year. These men have it together, no doubt. And congrats on finding a use of leopard print that’s at least classy. I must be in the minority, but I have a disdain animal prints in general, (with a few exceptions aka they have to be REALLY well done. This collar detail is tacky! The details are great! Love the leopard shirt, the clutch, and the beanie! Love the black coats and rolled pants! Great shot. Absolutely with you! You won! Hot damn thats a fine looking man clutch!!! He’s rocking the hell out if it too! I like his leopard pop but I love his “man” bag. I’ve been in multiple discussions with friend about this lately – he’s accumulating more stuff (tablet, reading glasses, invisalign) but has nothing to throw it into that doesn’t scream old – brief case – or young – back pack. Is a pouch the right way to go? I’m not actually looking at anything about the ankles of the guy on the left. His boots are superb. I totally agree with you. Just a hint of the pattern against such a subdued palette is perfect. Superbly executed. The turtleneck is essential I think. The next challenge…leopard with a bright. Black is too easy. Yes, but what happens to that leopard when the coat comes off? :) I kinda have to side with Garance on this one, BUT everything else (hair, shoes and the beautiful print on that bag) overrides the leopard. Is that a Mets hat? Agree Scott but being honest I personally do not wear leopard also in a sliver form like that ..
Love Pitti and love Florence! Tons of inspirations! I agree. A little leopard goes a long way! I love the random Knicks beanie hat!!!! I’m with Colony. . .everything changes when that coat comes off. I’m sure it screams “I’m wearing leopard” when he takes off his jacket. But, I like it regardless. Street fashion in the winter really only catches pieces of a person’s overall outfit. Hence, I’m ready for Summer! I just love the short trousers with the boots. I’m in total agreement with you on this. And even when that coat comes off, a vest won’t be overkill. Both of these men have such style! I like Libertine Libertine’s (danish brand) take on leopard for men. You totally won the bet. Great outfit all over bye the way. And the hair, so cool! funny how times change. i wore ankle length pants to visit my family over the holidays. it sparked a heated monologue from my six foot six inch grand father ant six foot four inch cousin…everybody’s tall whatever, the short pants make them think of pee wee herman…..but i like it if it’s done well. In fairness, this might look totally different w/o the jacket. like the sleeping silver mohawk. Nice. Incredibly ridiculous hems on the left.. I agree….next thing the pants will fall just below the knee…pants or shorts?? Instead, his pouch exclaims “I’m wearing some kind of girly damask!” :) Just kidding. The boots and the hair are awesome! Not to mention their beautiful choices in footwear!!!!!! His hair style sets-off that leopard pop. Short pants – FAIL. And, it looks like he’s not wearing any socks with the boots. Like it with low shoes, but the boots… eh… NO. I’m afraid I’m with Garance on this, but nice try for both you and your subject. Everything else about these two guys is just sharp. Even the leopard print adds dissonance, an edge of discomfort for me, which I do admire even if I don’t like it as such. Very stylish gentleman and supremely interesting cool looks. LOVE this look. so chic and way stylish. I think you win that bet. I think he pulls it off. I agree with everyone else that there are a few other elements in his look that are a wee bit more tricky, but still, that man knows what he’s doing and he’s doing it on purpose. I like that. What Brand? Left guy’s clutch bag. these men look so cool ! I would like to know how the man on the left “terminate” for lack of a better term his somewhat subdued Mohawk. This somewhat reminds me of an older fashion we had in south/central america, but he takes it to a rather tasteful level and I would like to see in what we he carries it through. Married, middle age italian men, avant-guard in their style, daring, fearless, this photo makes me think of the “man in the skirt”. I love to be surprised, to question the choice of an outfit. Either I like it or not (and I do, especially the shoes ! ), this photo is opened to debates. Anyone know what kind of boots the leopard-printed gent is wearing? GD is right , sorry Scottie! Scott, I have said it before in this forum, and I’ll say it again. Of all the places you photograph, Florence produces style that I admire most. True – just a sliver is just enough. Any more and it’s an odd disco era, shag carpet type feel that starts to develop. i hav to admit he missed 100% rating on his hairstyle, not so Piti Uomo, sorry…. Christopher Kane’s Fall 13 collections seems to also do leopard and menswear right as well. I love it, in my opinion he brought something cold and masculine to the leopard’s pattern. This fits perfectly with his outfit, for sure black fits dith everything but straight allure, and his color hair, it’s like a clash, between oppositions. A nano clash in the details. Matteo a destra non ha bisogno del leopardo !